You’ve probably figured out by now that my Big Food Project for this week was to make homemade pasta. 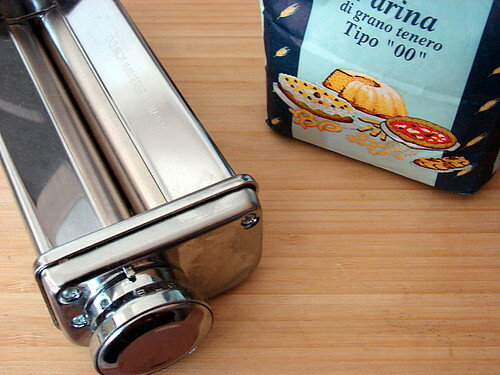 Now, this isn’t entirely new for me – in another time and place, I made pasta from scratch often, using a hand-crank pasta roller (one of the first kitchen gadgets I ever bought for myself). But as I got older, developed some issues with my hand and arm strength, and moved into a series of progressively tinier kitchens, that old hand-crank pasta roller did little more than gather dust. At our last apartment, there wasn’t a single patch of countertop or piece of furniture we could have attached it to to use it, so we ended up donating it in one of our mass culls before the move. But I missed making pasta from scratch. I read with envy as bloggers near and far worked with varying proportions of flour and eggs and sometimes other things added to the mix, and kneaded and rolled and made gorgeous, silken sheets of dough. I missed the smell of it, the texture, and the satisfying feeling of sitting down to a meal that was truly a labor of love. I yearned to make fresh pasta again, and my parents knew this, so a few years ago they gifted me with a shiny red Kitchen Aid mixer, my first ever, complete with pasta making attachments. I was so thrilled to receive yet another thoughtful gift from them, but there was one problem: we had nowhere. to. put. it. We had nowhere near enough counter space for it, but even worse, adding another box of stuff to our already cluttered apartment was just too much. So “Big Red,” as we had dubbed her, sat, unopened, under my desk at my old job until my last week there. As I neared my last day, I made arrangements to have her shipped, and she was waiting at our new place when we arrived. Big Red was the very first appliance I unpacked and set up in our new kitchen. So I was here, and Big Red was here with her lovely attachments, and why it has taken me this long to get to the pasta making I have NO idea, but I finally did it, and the first batch was so quick, so easy, and so satisfying that I immediately made a second batch, varying the recipe just a bit. There are probably as many ways to make fresh pasta as there are Italian grandmothers, but I decided to keep things straightforward to start, consulting my trusted Marcella Hazan for guidance. The proportions were simple: 1.5 cups flour (I did veer from her recipe by using “00” flour rather than unbleached all-purpose) plus 2 whole eggs. That’s it. 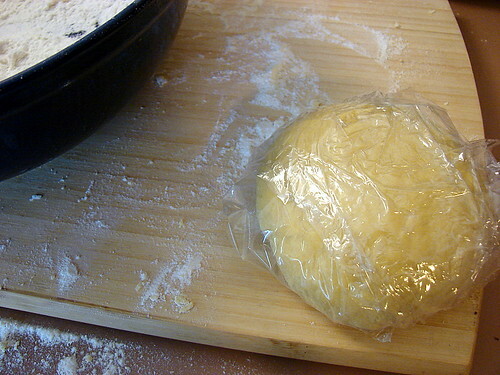 No salt, no milk, no olive oil, no water, just flour and eggs and 8 minutes of kneading before I would have my dough. 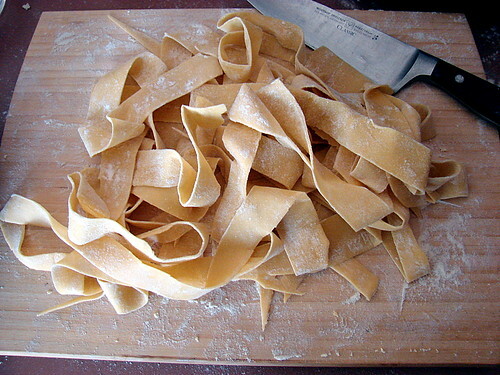 I rolled out my remaining pieces of dough, amazed at the speed and ease of which it was all happening, and after they dried just a bit, I cut them by hand into wide, pappardelle-like ribbons. They were, shall we say, “rustic.” But I was so pleased. 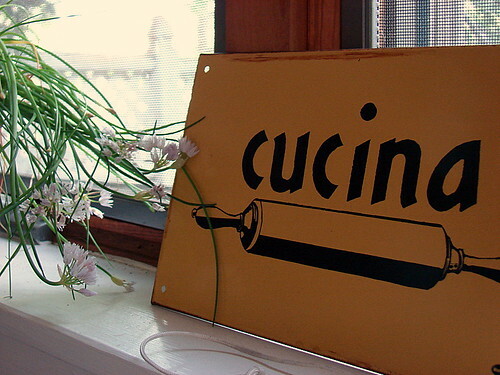 We had them for dinner that very night, dressed with an earthy chicken liver ragu. They cooked up beautifully, the pasta tender and delicate but still with a nice bite. 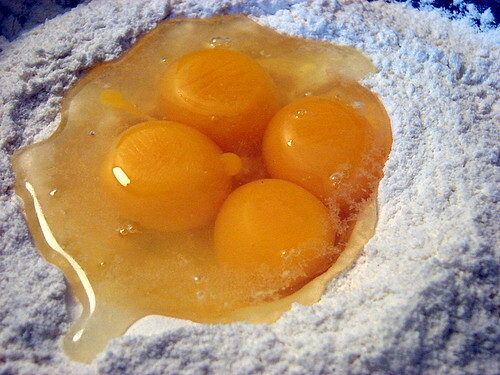 For my second batch of dough, I varied the recipe by using two whole eggs plus two egg yolks, to 1.5 cups of my “00” flour. This did take the entire amount of flour as I kneaded, and at 8 minutes the dough was definitely tighter than my first batch. Again, I let it rest for a bit before rolling it out into sheets, and I decided to break out the spaghetti cutter attachment. I let the ribbons of spaghetti dry before placing them into a zip-top bag and placing them into the freezer, where they remained until they became part of last night’s dinner. The sauce was inspired by the linguine with sardines and fennel we love so much, a mixture of caramelized fennel and onions, lemon juice and zest, a few chile flakes for heat, and some beautiful marinated anchovies we picked up at Venda Ravioli recently. 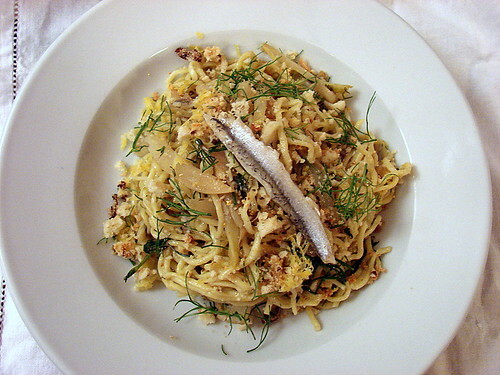 The finished dish got a sprinkling of fennel fronds, toasted breadcrumbs and more lemon zest. I was a bit worried about how the thin strands of spaghetti would do when they hit the boiling water – they looked so delicate – but they cooked up beautifully, and they had this great springiness to them which made them really fun to twirl around our forks and bite into. Mike and I both agreed that this first foray into pasta making with the help of our turbocharged assistant was a big success. I can’t wait to do it again. I have been reading and reading about making my own pasta recently. for my birthday next week, I plan on buying myself the kitchenaid rollers that claudia raved about. can’t wait, though admittedly, I am a bit nervous. I’ve only worked with dough once and it was a total failure. Jen, I also use Marcella as my guide for pasta-making, and a question: the surface-texture of the cooked pasta – was it a tiny bit slippery (slippery when wet)? I use the old hand-cranked pasta maker and decided that the flour I was using was at fault, making the surface too smooth: Unbleached All Purpose. What is 00 (yeah, I could Google, but this is more fun). Any thoughts? Your pasta looks delicious! The last time I made fresh pasta I broke my pasta machine and I haven’t got around to buying another yet. Your post inspires me to do it soon though! melissa – Thank you! 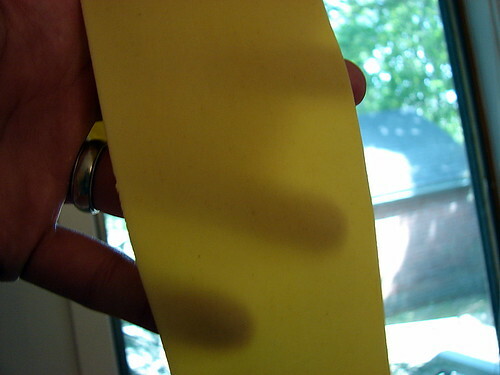 Don’t be nervous – particularly if you get the pasta roller attachments, it’s a breeze. Good luck! Marie – Slippery as in the sauce not adhering well to it? Hm. 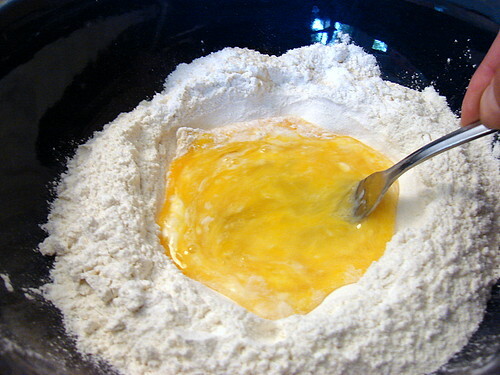 I didn’t really notice that with either of these pastas, but maybe that is because of using the different flour? 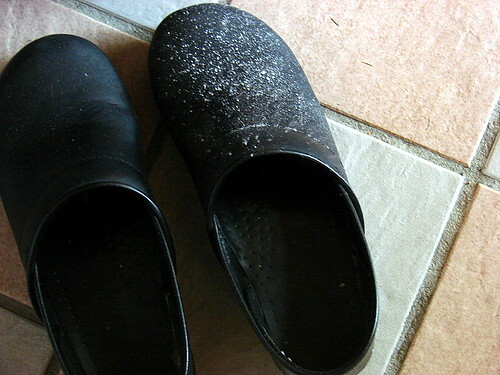 And to answer your question, “00” flour is very, very finely milled, and baby powder-soft. It is often used in both baking and pasta making in Italy, from what I’ve heard, and since I found some at one of the shops on Federal Hill, I figured I’d buy some and give it a whirl. 🙂 I have seen it at a few shops in NYC as well (Bedford Cheese and Formaggio Essex, in particular). Helen – Eeek! I’m addicted to the pasta making now, so I’d say buy yourself a replacement soon! at the beginning of april, I had my first adventure in homemade pasta. I have a red kitchenaid as well (and also have negative counterspace on which to put her). I have received as gifts, for a variety of occasions, the pasta roller, pasta cutter, pasta plates (for the grinder attachment), plus the ravioli maker. when I did my pasta, I opted to create some ravioli with the sheets. while tremendously messy (it was my first time! ), it made some damn good ravs. I can’t wait until I have time (and counterspace) to make more. yours looks fabulous! can’t wait to hear about more pasta recipe variations. 🙂 I call my smallest Le Creuset pot “little red”…your post made me smile…long lives to both big and little red. utter beauty this pasta is. 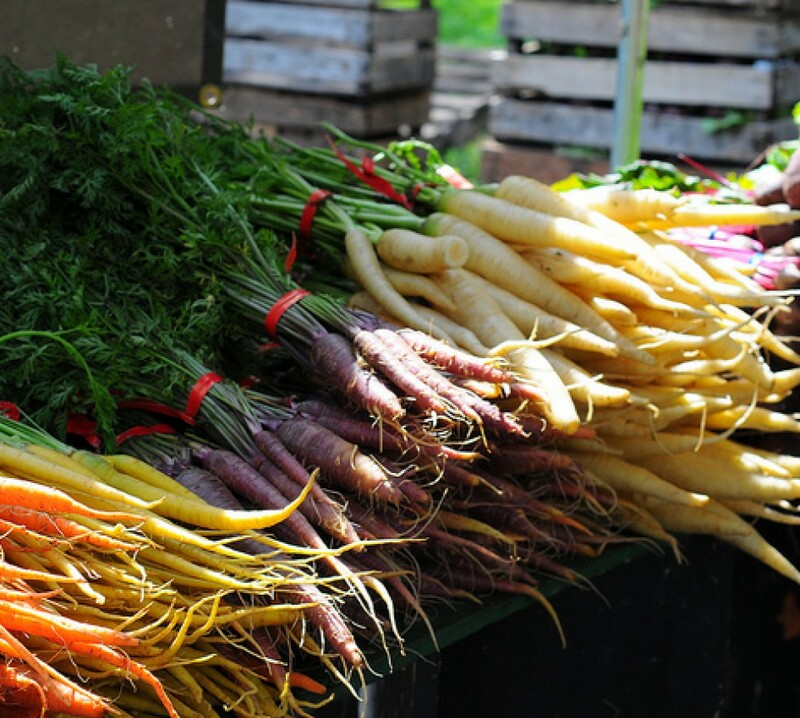 i adore marcella hazan- love that you used her guidance. beautiful photos.